This weeks nominated Toy Soldier from amongst the ranks is Danov Valravn! 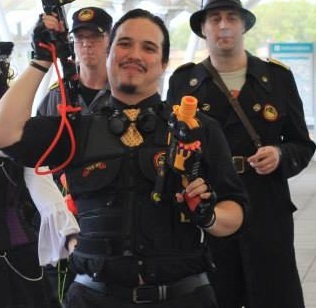 Danov Valravn joined the Army of Toy Soldiers not long ago when he began recruiting at the Manchester MCM Expo. And together with his lovely wife Amber, Danov has been promoting and spreading propaganda at their own stall during the London MCM Expo. However it is not only for his marvelous efforts he has been nominated to receive the Toy Soldier of The Week award, but also he’s stirring speech performed outside the Expo, and his brilliant showmanship, earning him cheers from the crowds of cosplayers and convention attendee’s! Danov Valravn, we the Army of Toy Soldiers, SALUTE YOU!